This print is an odd case because some sources say it dates from 1829 and others from 1830. 1829 would make it an image of Arashi Rikan II, however, Arashi Rikan III's name and yagō Okajma-ya (岡島屋) appears at the beginning of the text below. 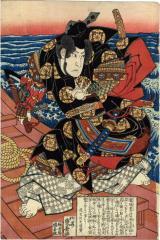 Illustrated in color in Ikeda Bunko, Kamigata yakusha-e shūsei (Collected Kamigata Actor Prints), vol. 2, Osaka, 1998, no 122. Their information gives the publisher as Wataya Kihei. This may well represent a performance at the Horie Ichinogawa theater and may be the right hand companion to another print in the Lyon Collection, #29, even though the shape of the cartouches are somewhat different.